Before you land the trophy fish you're casting for, hook one of the best deals in fishing, a Mitchell Avocet II Gold Spinning Reel. Mitchell's Avocet II Gold Reels are built with many of the same features high-end reels have, but the big difference is the one you're sure to notice - the money left in your wallet! To ensure the Avocet II Gold Spinning Reels deliver the reliability, performance and durability every angler wants, the Avocet II Gold Reels features eight ball bearings with instant anti-reverse, dual bearing supported pinion, heavy-duty metal gears, everlast spring system and an EZ flow balanced rotor. Plus, the Avocet II Gold Reels include a spare spool for added value and convenience. "I purchased this reel for crappie fishing and it is the smoothest reel for the money. 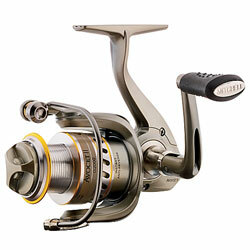 I compared the Mitchell against other reels at BPS and it has the smoothest feel of all the reels below $50." "This is one of the smoothest reels i have ever used and it won't break the bank." "This is a awsome reel, Very powerful yet still small. I have the G500UL and its the best panfish reel I have ever owned....very sleek, powerful,dependable. smooth casting and just as smooth retrieve!!!" "Hands down I think that this is the best spinning reel for the price. It preforms great. It runs smooth, and makes long cast. I like this reel a lot."